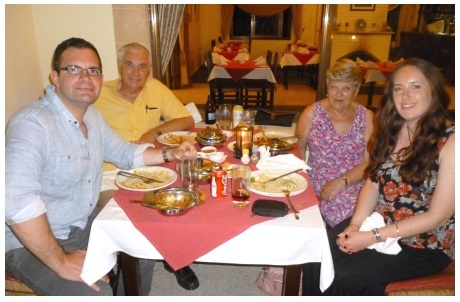 Chris’s son Ryan and his girlfriend, Kay, came from Cheshire to North Cyprus for a short visit and we had a meal out one evening at Al Shaheen in Karakum as Ryan and Kay are both rather partial to a nice curry. We started off with Poppadoms with a generous selection of dips, followed by starters which included Prawn Cocktail, Keema Kofte, Fish Pekora and Aubergine Bhaji a nice variety which we all agreed were delicious. Then came the main course – I had the Vegetable Bake with saute potatoes (Vegetarian option) and Chris and Kay had the Al Shaheen Special Chicken Karahi, Ryan chose Chicken Bhoona. I was too full for a dessert but Chris decided on ice cream and Ryan and Kay shared a Banoffee Pie. By the time we had consumed all that food we were decidedly full! We had a lovely meal so thanks to Imtiaz, Ashraf and their staff for making it a very enjoyable evening.